In a game of hardball, Justin Morneau was just pulled from the lineup. After a 14 year career with the Minnesota Twins organization, the former MVP and fan favorite has been traded to the Pittsburgh Pirates. It’s a move that reminds fans that baseball is a business. But Morneau is smart enough to realize he is more than a consequence of that business, he is also a brand unto himself. And any time there is an event that makes a brand’s enthusiasts (fans) question their loyalty and support or threatens the relationship, there is a potential crisis. Morneau’s response serves as a simple blueprint for executives, brand managers and communicators everywhere in how to respond. Gratitude: Appreciation for the opportunity and loyalty. Contrition: Apology for not achieving more. Praise: Love for the people and the relationships with them. First of all, I would like to say thank you to all of the Twins fans. I would also like to thank the Minnesota Twins organization for giving me a chance to realize my dream of being a Major League baseball player. 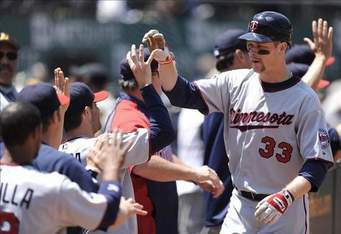 I was drafted by the Minnesota Twins in 1999. Since that day I have been very proud and fortunate to call myself a Minnesota Twin. I was a wide-eyed 22 year kid when I made my big league debut in 2003. I received a warm welcome that day and have felt welcomed ever since. I feel like I was a kid when I first got here, but was able to grow up in this organization and become someone my friends and family could be proud of. My wife, kids and family are Minnesotans and this has become my second home. Minnesotans are some of the kindest, most genuine people I have ever met. I am sorry that during my time here we weren’t able to achieve our ultimate goal of winning the World Series, but I will forever carry many wonderful memories of my time here. I will always cherish every day I was lucky enough to play in front of you fans in a Minnesota uniform. Thank you for all of your support throughout the years. Classy. Wouldn’t it be great if athletes and communicators in every league would steal this page from Morneau’s play book? ← A Diabetic’s Guide to Eating at the State Fair!